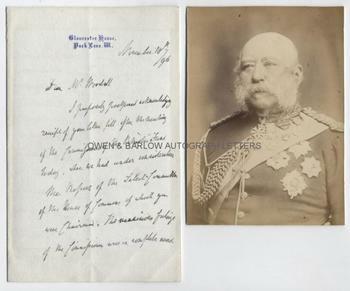 PRINCE GEORGE DUKE OF CAMBRIDGE AUTOGRAPH LETTER Signed. Prince George William Frederick Charles. Grand-son of George III. Styled Duke of Cambridge from 1850. 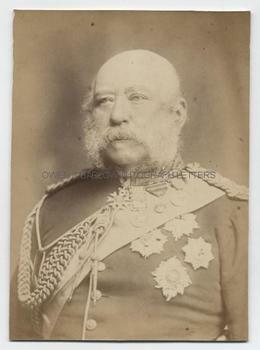 Commander-in-Chief of the British Army from 1856 to 1895. ALS. 3pp. Gloucester House, Park Lane, W. November 10th, 1896. To [William] Woodall. Together with a fine portrait photograph. "I purposely postponed acknowledging receipt of your letter till after the meeting of the Commissioners of the Patriotic Fund, today, when we had under consideration the Report of the Select Committee of the House of Commons of which you were chairman. The unanimous feelings of the Commissioners were in complete accord with the opinion expressed by you in your letter to me, and we all considered that on Sunday Colonel Young had performed his duty admirably by thoroughly explaining, in the minutest detail, the exact position in which the Commissioners are placed, and justifying their acts, in such cases as have hitherto been misunderstood by a considerable portion of the public. I hope that henceforth confidence will be placed in me and that powers may be granted to us to collect and consolidate the considerable funds placed at our disposal, in which endevour I feel assured our efforts will be backed by your powerful aid as Chairman of the House of Commons Committee, which will be of such value to myself and my colleagues in the complicated and somewhat difficult task we are called upon to carry out." 8vo. Approx 7 x 4.5 inches. Mounting residue on blank verso of last leaf, else fine. The photograph is a 19th century gelatin silverprint cabinet photograph mounted on original photographers pasteboard. It measures approx 5.5 x 4 inches. It shows Prince George Duke of Cambridge in dress uniform of Field Marshal and Commander-in-Chief of the Forces. 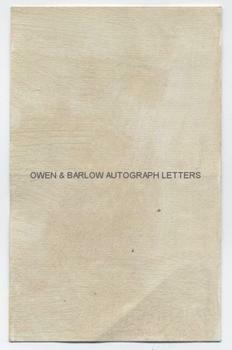 There is mounting residue on the verso but the photograph and image are in fine condition. Both the letter and the photograph are from a 19th century collection made by the radical Liberal M.P., William Woodall. The Duke of Cambridge was the longest serving Commander-in-Chief of the British Armed Forces. He was a conservative at heart and could never be said to have been a reformer of the army, although he did have their best interests at heart and was a tireless patron of army charities. The Royal Patriotic Fund was established to pay pensions to old soldiers and sailors who had fought in the many conflicts around the British Empire. At the date of this letter, the Duke of Cambridge was still Chairman of the Commissioners, although he had retired from his position as head of the army the previous year, 1895. He had retired with a public pension of £1,800 per annum and questions had been asked in Parliament and around the country about whether this could be justified in view of the many pensionless Crimean veterans in the workhouses of Britain and Ireland. It was felt that large proportions of the Fund were undistributed for no good reason. At a Parliamentary Enquiry into the Fund, the Duke of Cambridge had been asked about the distribution of the Fund and had replied that it was necessary to maintain a large capital, in order to have sufficient to pay out the soldier's pensions that had already been alloted. 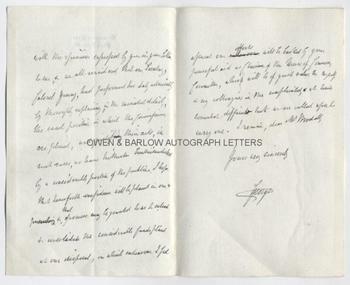 His letter to Woodall demonstrates the thinly disguised hurt the Duke of Cambridge had felt in having his decisions publicly called into question.